Audiences in 1958 sat down to watch Vincent Price in a film about a scientist whose DNA is fused with a fly's during a teleportation experiment gone awry. Nearly 30 years later, in 1986, audiences went to see a David Cronenberg film with the same basic premise, but got something entirely different than the original—and some literally left the theater sick from seeing it. As the update of The Fly zooms toward its 30th anniversary, we're looking back at some things you might not have known the gory horror classic. 1. IT WAS PRODUCED BY MEL BROOKS. Known as a master of comedy, Mel Brooks is also a fan of the horror genre. Producer Stuart Cornfeld convinced the reluctant studio to distribute the film if he could find the money to make it, and Mel Brooks was the first person he went to for help (the two had previously collaborated on David Lynch's The Elephant Man in 1980). It was Brooks who encouraged Cronenberg to take the movie as far as he wanted. "[Brooks] said ‘I want you to go all the way. Let yourself go, and don’t hold back.’ There were no restraints," Cronenberg recalled. "They were willing to lose that percentage of the audience that would have liked the love interest stuff, but couldn’t take the horror." 2. BROOKS CAME UP WITH THE FILM'S MOST FAMOUS LINE. “Be afraid, be very afraid” is a quote that many people have heard, but not everyone knows comes from The Fly. Cronenberg revealed in a commentary track that the iconic line was invented by Mel Brooks while discussing how characters should react to the early stages of Seth Brundle’s transformation. The quote also became one of the film’s taglines. 3. IT WAS ALMOST NOT DIRECTED BY DAVID CRONENBERG. Stuart Cornfeld wanted Cronenberg for the project, but the director was busy working on Total Recall. Another young director named Robert Bierman was brought on to make the film, but during the early stages of pre-production, a family tragedy caused him to withdraw from it, with Mel Brooks’ consent. After a brief period of not having a director or a finalized script, Cornfeld learned that Cronenberg’s involvement with Total Recall was unexpectedly ending, which meant that he was free. He recalled in a DVD special features interview that Cronenberg agreed to direct and help rewrite the script for $750,000, so Mel Brooks wrote a letter to the heads of the studio and was able to counter with $1,000,000. "Fastest deal I've ever seen made in Hollywood," Cornfeld said. 4. JEFF GOLDBLUM WAS A MAJOR GAMBLE AS THE LEAD. Jeff Goldblum was the opposite of what the filmmakers thought would work for the stages of man-to-fly transformation. "Casting was a major major issue," creature effects artist Chris Walas said in a DVD special feature interview. When he and the effects team signed on to the project, they asked Cronenberg to make finding the lead actor the number one priority because it would be the hardest part of their job. The director asked Walas for input in terms of physical attributes that would help the effects team. "Get somebody with no ears and no bridge of the nose so that way we have a lot more control with the makeup," Walas said. 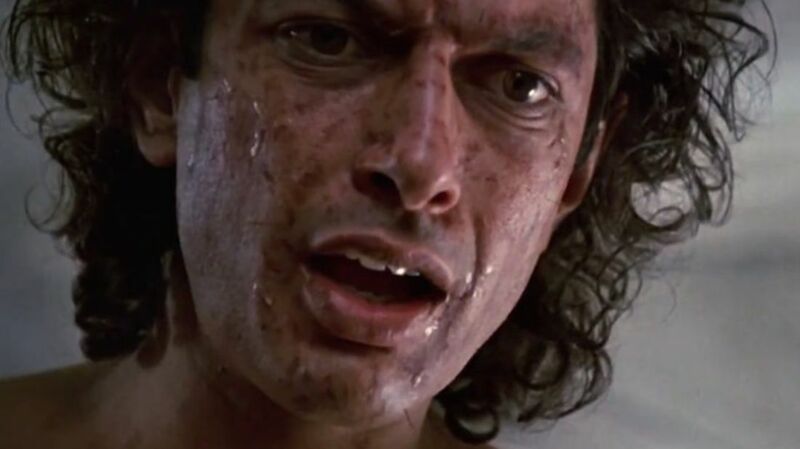 When Goldblum was mentioned as the top choice, Walas and the others agreed that it was not what they wanted, but they were fans of the actor so they wanted to make it work. In addition to the makeup concerns, not everyone was convinced that Goldblum was the right choice as the character of Seth Brundle. Cornfeld reveals in a making-of documentary that when he told the studio about their choice, former 20th Century Fox president Larry Gordon called it an “absolutely horrible mistake,” but he greenlit the decision anyway because he felt it was the filmmakers’ mistake to make. 5. JEFF GOLDBLUM AND GEENA DAVIS WERE A COUPLE. Goldblum was the one who campaigned for then-girlfriend Geena Davis to co-star in the film as journalist/love interest Veronica Quaife, a.k.a. Ronnie. Goldblum admits in a special features documentary that he became jealous of her scenes with actor John Getz and had to be told to leave the set because of his emotional attachment. Their relationship also affected the way they performed the roles. "The problem really in working with a couple who were so close and had been together for quite some time was that Geena, who was an adept mimic, she would basically do Jeff," Cronenberg said in his commentary track. "She was like Jeff in her linguistic rhythm, her speech rhythm, and her body language because Jeff has a very strange and infectious way of speaking and moving ...one of the things we had to do was to disconnect Geena and Jeff for the sake of the movie." 6. THE TELEPODS WERE INSPIRED BY CRONENBERG’S MOTORCYCLE. Cronenberg described the early designs of the now-iconic teleportation pods in his DVD commentary as being more like phone booths or glass showers. The final design took inspiration from the cylindrical structure of Cronenberg’s vintage Ducati 450 Desmo motorcycle (when it was placed upside down). The name of the lead character also came from the director’s obsession with fast things. "The name Brundle I took from a Formula 1 racer named Martin Brundle," Cronenberg said in his commentary. "A lot of the names I invent for my characters come from the annals of motor racing. I don't know why, for some reason I'm just a big enthusiast of motor racing." 7. TYPHOON THE BABOON WAS SCARY TO WORK WITH. Those involved with the making of the film, including Cronenberg, remember that the baboon (whose name was Typhoon) was very much a wild animal, and not an actor. Visual effects supervisor Hoyt Yeatman said in a special features documentary that Typhoon was once startled by the flashing lights in the telepod and broke the door off to get out. The wrangler and Jeff Goldblum (who is 6'4") were the ones who had to keep the primate in check. "They're very volatile, and there's no such thing as a tame baboon," Cronenberg said. "Jeff, because he was much bigger and stronger than the baboon, was able to dominate him, and the baboon's wrangler said it was a good thing that the baboon formed that relationship ... Otherwise there could have been big trouble on the set with some of the female members of the crew." 8. SOME PARTICULARLY GRAPHIC SCENES WERE CUT. In a special features documentary, Cornfeld revealed that after screening the film for audiences, he and his team decided that some pretty interesting scenes just did not work in the film. After Brundlefly dissolves a leg with his fly vomit, a scene was shot that involved close-ups of him consuming the severed foot (which actor John Getz kept in his refrigerator after filming). Another scene in the lab involved an experiment by Brundlefly that resulted in a crazed hybrid animal that was half baboon and half cat, which is included on the DVD as a deleted scene. In it, Brundlefly chases the creature and beats it repeatedly with a lead pipe. He later goes to the roof of his building in anguish and falls off. After sliding down the side of his building, the protagonist grows a small arm from his torso and proceeds to chew it off. "When we screened it," Cornfeld said," besides being a little too intense, this one woman had thrown up ... it taught us a very valuable lesson. We were basically telling a story where the protagonist on some level becomes the antagonist, and we had to keep the audience locked into the tragedy that this guy was going through. If you beat an animal, even a cat-monkey, to death with a lead pipe, your audience is no longer interested in your problems." 9. THE BRUNDLE CHARACTER LOST HIS VOICE IN AN EARLIER VERSION. Like the original film from 1958, one version of the script for the 1986 film had Brundle losing his ability to speak while becoming more fly-like. “I wanted Brundle to be very articulate about what he does because I wanted him to be very articulate about what was happening to him as the film progressed," Cronenberg said in his commentary. "I wanted to hear what Brundle's experience of transformation was ... that's one of the more subtle but really more important changes that I made to the way that his disease, his transformation, progresses." 10. CRONENBERG’S CAMEO WAS NOT HIS IDEA. In a dream sequence, (SPOILER) Ronnie is at the doctor’s office giving birth to Brundlefly’s larva. Cronenberg plays the gynecologist who delivers the baby, but he said in the DVD commentary that it was Geena Davis’s idea, not his, that he appear in the film. "It wasn't something that I wanted, and it's not something that I do," Cronenberg said. "Geena asked me to do this role because she just felt she wanted me there ... if anybody was going to be in that position when she was up in the stirrups, she would rather it be her director, so I said I would do it knowing that my face would be covered and I could get someone to dub my lines if I wasn't happy with my performance." 11. IT SPAWNED A STAGE OPERA.